Here at Fourward Glass Gallery in downtown St. Petersburg, we have a selections of some of the finest buckets, bangers, and nails in Florida. Some of our signature lines include Mayoral Quartz Bangers, Crystal Star Quartz, Quave Club Bangers, Crystal Star Quartz Thermals,and a line of smaller quartz and titanium nails for any occasion. We even carry a nice array of inexpensive Mountain Glass Art US quartz bangers starting at $25! What would a nail be without a torch?! Here at the gallery we have found a few well priced and high quality brands. Our Newport brand butane torches are $35 and come in four colors: Silver, Black, Blue and Red. They function with both a jet and soft flame using a simple valve adjustment. All Newport torches are warrantied against defects in the material or manufacturing through the company. We have also found that the Blazer line of torches can get our quartz up to temperature at a steady rate in a short time. The standard Blazer Big Buddy torches we carry come in Black with black body as well as a chrome body with purple trim and a chrome body with a white trim. They have an adjustable jet size using a simple sliding lock on the side of the torch. They also start at $35. Though we find our Newport and Standard Blazer can get the job done, we do carry a larger, Blazer Big Shot Torch in black at $60 as well as Limited Edition Higher Standards and Limited Edition Red Blazer Big Shot Torches for $70. They, like the standard blazers, have an anti-flare brass nozzle, piezo self-ignition system, with a turbo flame peaking at ~2500ºF. We will be carrying limited edition Higher Standard Blazers in a red and a white at $70 while supplies last. Butane comes in many different brands, as well as well as having slightly different refining processes, it can be confusing when choosing a reliable brand. 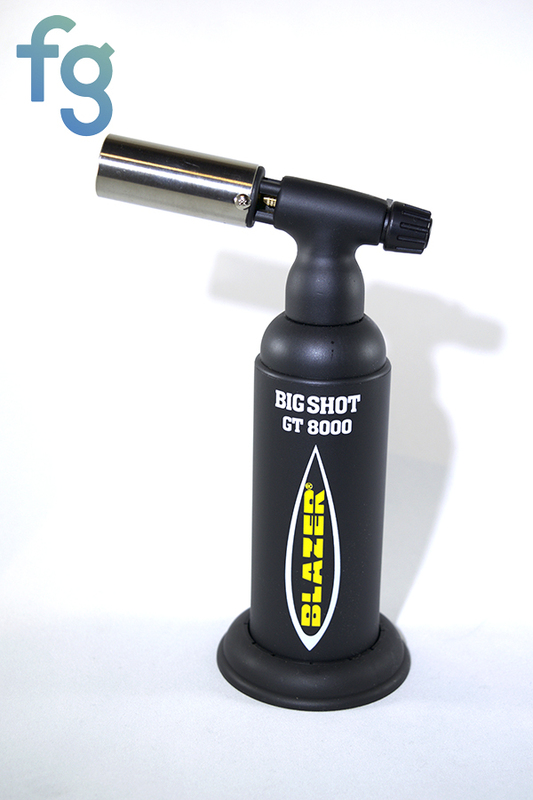 We have found our Blazer brand butane comes with a few different valve size attachments in the cap of the canister. It is always handy to have those attachments as often, lighters can have different valve ports depending on make, year, size, and brand. We also carry a Puretane brand butane, as through popular request and personal use, we have found it comparable to the Blazer brand butane. As far as the correct nail and torch combination, the Fourward Glass family have had plenty of experience using buckets of varying quality and size. When using a quartz bucket we highly recommend using a carb cap to seal in any vapor produced. 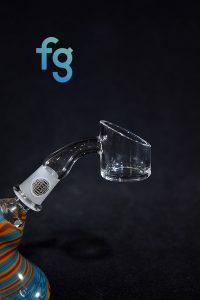 There are several options in styles of carb cap: Directional Flow, which is a flat cap with a funnel hole to direct the airflow around your bucket. Bubble Cap, which is a round cap with a funnel hole to direct airflow around your bucket. The round shape of the bubble cap allows for less restricted movement of where you direct the air into your bucket. Personally we are favorites of Quave Club Bangers for their quality as well as variety of sizes. We personally use Crystal Star Quartz due to their quality, great price point as well as their heat retention. We recommend using quartz nails over titanium for their health benefits of not inhaling off heated metal as well as their heat retention. Whether you are using a top of the line custom heady glass pipe or a production scientific piece; we always recommend using quartz. Thank you all for your continued support and love.